Asparagus is a spring vegetable. It is considered a delicacy in the vegetable world and has a distinct, intense savory flavor. As with a lot of vegetables, water makes up 93% of asparagus’s composition. Other than that it is low in calories it is also a good source of dietary fiber. You can offer your rabbit asparagus but start with a small amount if it’s the first time feeding. 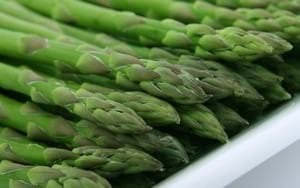 Keep an eye on the stools and if everything looks normal you can add asparagus into the rotation of fresh vegetables that are part of your rabbit’s diet. There is a chance your bunny might not even like asparagus as it is listed as one of the plants not usually eaten by rabbits. We found some accounts that seem to confirm this statement. As every rabbit is different, just present it with a little bit of asparagus to find out. Before serving, give the asparagus stems a good rinse under running water. Then cut or snap the stalk into 1 inch (=2.5cm) pieces and mix them in with the leafy greens. Keep portions small, give a couple of pieces per rabbit per day. Conclusion: rabbits can eat asparagus, they just might not like it that much. Does your bunny like asparagus? Leave a message in the comment section.